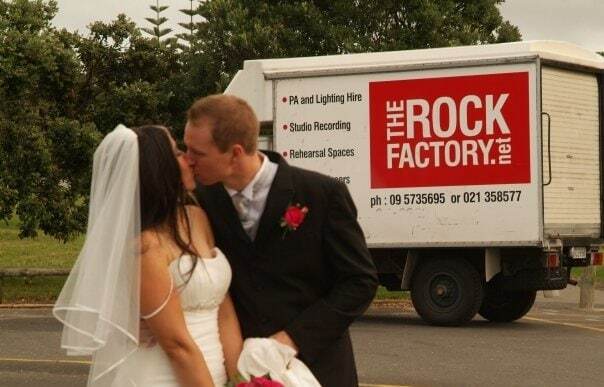 Started in January, 2004 by husband and wife team Mark Rawstron and Michelle Klaessens, The Rock Factory has been dedicated to providing quality live sound production and in-studio recording for local bands and acts at a great price for over 10 years. From our humble beginnings, we have grown into a business outfitted with everything an event of any size could need including sound systems, audio video, DJ gear, lighting equipment, stage and party hire. Both Mark and Michelle are musicians and trained sound engineers – meaning we know what artists are looking for as well as understanding the technical details to provide them with the highest quality recording services in at our Auckland music studio. With everything that we offer from entertainment and event production to our editing, mixing, production and mastering services, we are a convenient “one-stop-shop” for local event organisers, musicians and promoters. We are also proud parents of a toddler boy who keep us on our toes! Our other baby is the rock factory itself… who is almost a teenager now! Event management, staging and studio music recording can be stressful. It’s our belief at The Rock Factory that there is an easier, more efficient and less stressful way to get everything you need to run an event or lay down, mix and master your single, EP or album. We strive to provide smarter audio and sound system and staging solutions for higher quality at a sustainable price. Every package or system we provide is customised to suit every clients’ need and we’re always working to meet individual requirements. Every event, every recording and every artist is different – it’s our goal to tailor solutions for these specific needs. With the experience we have, we’re able to work from the perspective of both the organiser and the entertainer. The Rock Factory isn’t just a business. We have grown to support the community of local Auckland musicians, bands, event organisers, DJs, schools, tertiary institutions and venues. We help each other out and provide a trusted service. It’s our goal to get your name out there by providing professional quality recording studio services and through quality sound reinforcement backline, staging and lighting at live gigs… Anyway, if you have read this far, you probably have too much time on your hands!! 😉 Get back to… your life and live it by being awesome okay! Check out our production hire price lists, find out more about the Auckland recording studio, catch up on the latest news and see some of The Rock Factory media for yourself. You can also find a bunch of helpful info for artists along with testimonials and learn a bit about our clients on our Friends of The Rock Factory page.